For this month’s bridal tips, we are chitchatting about party favors – should you add them to your wedding day budget; what are popular options; what alternatives are there to the traditional idea of what a party favor is? A fun item to have, but not necessarily required, party favors are a great little thank you gift for your guests for being a part of your big day. 1. Should you or shouldn’t you add party favors to your wedding day budget? By far one of the biggest questions we get when it comes to party favors. A lot of our couples are in debate about the added expense of party favors and ask us for our take on them. I have to be honest, we do see a LOT of party favors left over at the end of the night since we are typically one of the last ones out the door. However, with that said, we also do see guests enjoying (and making a point to take home) party favors that are a little more “custom” or “unique,” if you will. For example, my couple Erica and Merdad surprised guests with beautiful unique metal pomegranate trinket boxes. Each one opened up to allow for storage of smaller items. What I loved about the uniqueness of my couple’s choice of party favor, is that the pomegranate is a symbol of life and marriage, which couldn’t be more perfect for a wedding day! Another party favor example, guests ALWAYS take home is chocolate and other sweet treats. My couple Lisa and Jouse opted for a custom candy bar where guests could pick the sweet treats they wanted to take home. Florida Candy Buffets created a silver and white themed bar that was customized to match my couple’s wedding color scheme. 2. Options, options, options! There are so many options for party favors. Here are a few of our recent favorites… Caitlyn and Nick opted for custom labels on Jones soda bottles for each guest to take home – silly and fun, it was definitely a hit! Gillian and Josh had a fall themed wedding, which included white pumpkin party favors that had scripted names written for every guest (these little pumpkins were also multifunctional, as they were also the seat assignments). 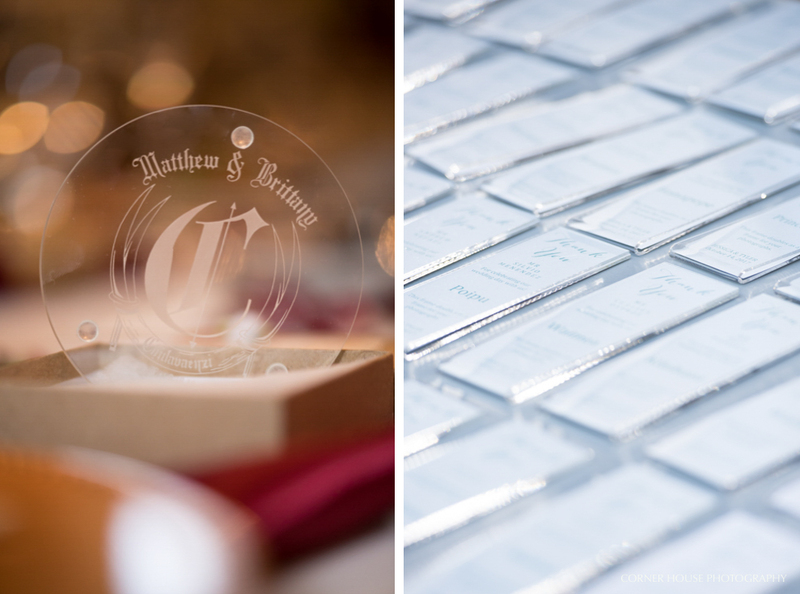 Brittany and Matthew showcased glass engraved ornaments for guests to take home during their big day to remember the special moment. Jessica and Tyler included a sweet message in a magnetic photo booth frame for guests to place their photo booth strips in and stick them on their fridge. 3. Other alternatives to party favors? Some of my couples opt for alternatives to either where the budget would have been placed on party favors or something completely out of the box. One of my absolute favorite alternatives, is what I like to call an “experience” for guests to have. Tamara and Fouad surprised guests with an experience of Stuff from the Orlando Magic showing up to dance during their reception. Bringing along with him a ton of streamers, he really brought the party! An out of the box idea, Connie and Casey are avid dog lovers and wanted to incorporate their pups into their wedding through a party favor for guests to take home for the pups of their guests! The two put together a treat station that featured an array of biscuits in little paper gift bags. No matter what party favor you do or don’t do, when it comes down to it, your guests are celebrating the moment of the two of you and not necessarily a take home gift. If it is within budget though, a sweet little gift goodbye is a great way to thank your guests for coming.